At last! 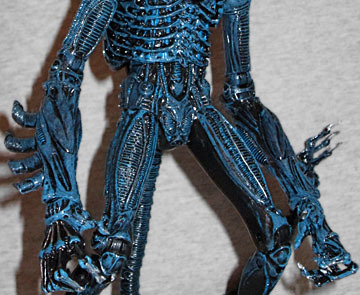 After numerous Kenner-inspired Predators, NECA brings the same style to the Aliens! So wait, the special tactical advice they give for this Alien is "shoot it a whole bunch"? Isn't that the advice for all the Aliens? And how do they know the acid concentration of its blood? For that matter, why does it even matter? If 75.32% is high, what's low? Or average? Human blood has a pH level of about 7.4; what does that translate to in percentage? This random info copied from 1992 raises more questions than it answers! For their first (well, second third) Kenner homage, NECA chose the Gorilla Alien, a wonderfully fine choice. Why is that one good? 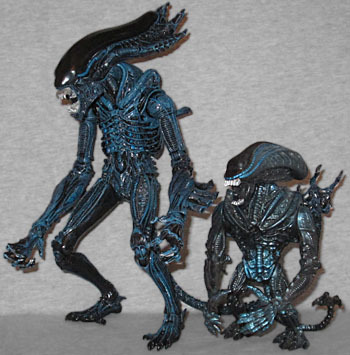 Because until the two-pack came out, the Gorilla Alien was the "plainest" Alien available. In a line of crazy creatures, the Gorilla was the closest to the aliens seen in the movies, and so we all had one. Humans like things we've seen before, so you can't go wrong with nostalgia! That said, being closest to the movie appearance doesn't really mean much when your competition is a xeno with a rhinoceros horn or one with the body of a snake. I mean, for one thing, it was blue; and sure, sometimes Aliens are (incorrectly) shown as blue, but this was a bright, metallic shade. 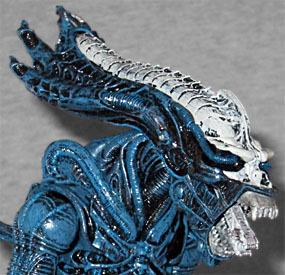 NECA has kept the blue, but gone with a more reserved version. In fact, it's pretty much the same as their other blue Aliens. 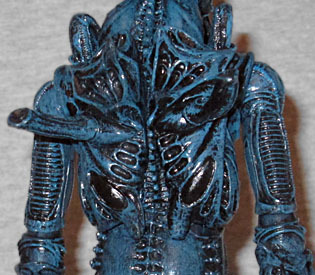 The blue is, naturally, only applied to the higher areas of the figure, with the lower inset bits remaining black - it's not like the figure is "Hank McCoy blue" or anything. His fingernails get silver paint apps, but not his toes - those are still black. Another thing that set the Gorilla Alien apart from its cinematic cousins was its proportions: like its animalistic namesake, it had a broad chest, long arms, and short legs. NECA's mostly uses the same mold as the rest of their Aliens (mostly), but gets some new pieces to make it feel more like the old toy. The hands are larger and thicker, the long forearms have the sort of tubes coming off them normally only seen on the xenos' backs, and the back itself is a new cap glued to the existing mold in order to bulk up the torso. That's a clever way of doing it, especially since the organic nature of the sculpt helps hide the join. The original toy had an action feature: squeezing the levers on its back would make its arms fling wide open; NECA's doesn't do that, but it still has the two tubes molded on its back in just the right place. The toy's head is also a new sculpt. 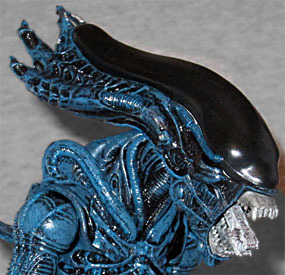 Kenner gave their gorilla a wider head than the average Alien, but NECA has taken that a step further: rather than just being bulbous, the extra width on the cranium is done as a series of hard, angled spikes, kind of like an evolutionary baby-step toward a Queen's head-frill. The face is larger than usual, with a big blocky jaw. If you remove the smooth cap on top of the head (you have your choice of smoky translucent or solid black, you'll see that the skull embedded in there is not human, as it usually is, but is clearly based on a gorilla - heavy brow, forward-angled teeth, a ridge over the top, all that. Fun choice! The articulation is the same as always: hinged toes, balljointed ankles, double-hinged knees, swivel thighs, swivel/hinge hips, a balljointed torso, swivel/hinge wrists, double-swivel/hinge elbows, swivel biceps, swivel/hinge shoulders, a balljointed head, and a hinged jaw. The inner jaw extends, and the tail is bendy. The original Gorilla Alien had another hand at the end of its tail, so this one does too. There's a joint that's supposed to allow the head to slide forward or back, which I only know because the head on my first one popped off. The right knee is also a little loose, making that leg more likely to collapse, leaving the figure to tip over sideways. 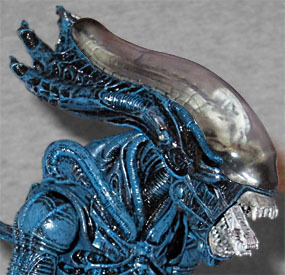 In addition to the swappable head-domes, Gorilla Alien comes with a blue facehugger, because the original did, and a mini-comic from Dark Horse, because the original also did. The comic shows the "gorillas" this Alien gestated inside, which makes us wonder why it only has two arms, not four. 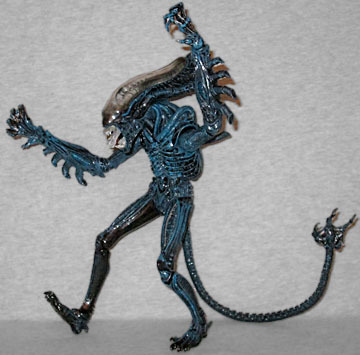 Back in the '90s, the Gorilla Alien was a good figure, because it was plain enough to pass for normal. 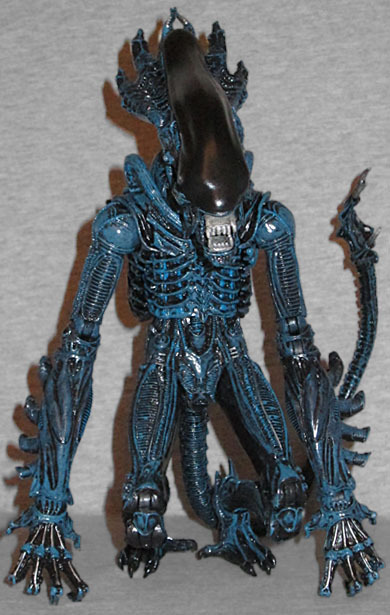 NECA's done a wonderful job updating the old figure into something new, and yet the new figure is close enough to the usual Aliens that it won't look out of place in your collection.